April is National Poetry Month. National Poetry Month was inaugurated by the Academy of American Poets in 1996. 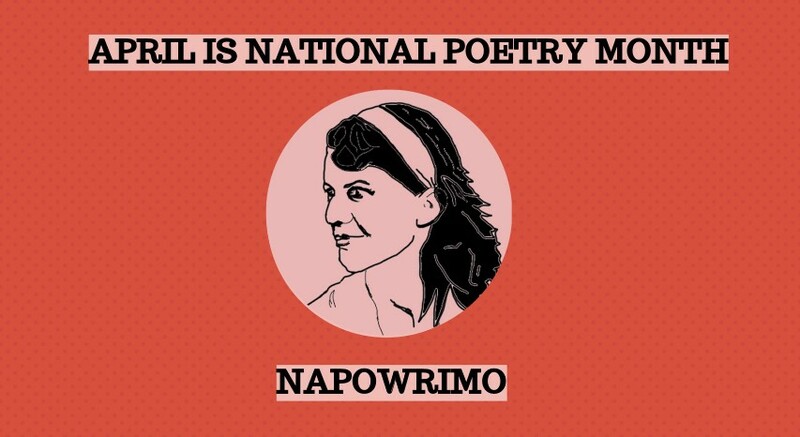 It’s also NaPoWriMo (National Poetry Writing Month)— an offshoot of NaNoWriMo (National Novel Writing Month). During this month, magazines, workshops, radio shows, news sources, and readings showcase poetry in all its forms. Writers participate in the challenge of writing one poem a day during the month of April. I’ve been a NaPoWriMo follower for about four years now. I started NaPoWriMo as a natural extension of my writing practice. I’d done NaNoWriMo before and wanted to do the same for poetry. But I soon learned that writing a poem a day is much different than trying to cram 50,000 words into 30 days. A poem a day is liberating. It’s exploratory. It’s effing magical. When you’re trying to write 50,000 words in a month for NaNoWriMo, you’re basically just thinking about word count. Did I make my count today? Did anyone else? How far am I from done? Where the heck is my book going to take me today? Can I accomplish what this scene needs in the 1,666 words I need to make today? You’re crafting a story and you’re having to think about the mechanics of what a book is. There’s often hours and hours of outlining necessary to make NaNoWriMo a success. It’s in NOVEMBER (Who decided THAT was a good month to try and write a book?) the month of holidays, in-laws, and too much eating. It’s hard work and often exhausting. I’ve only “won” NaNoWriMo once. Over the years I’ve done different iterations of NaPoWriMo. This February, I did an Instagram challenge where I wrote a tiny love poem a day. One year I wrote mostly erasures or blackout poetry. I started with just a simple pen and notebook, posting my experiments to my blog (You can read most of them in my blog archives.) What I figured out is that NaPoWriMo is different than NaNoWriMo because it’s basically just one poem a day. What a poem IS can vary. Write a haiku? That counts. Write a long narrative piece? Still counts. A series of sonnets? Yep, that too. There is so much you can do with poetry. The other magical thing about NaPoWriMo is that it helps you develop a writing practice. I’m a big believer in writing often. That does not necessarily mean writing every day, although if you have that ability then I say go for it. I can only manage a NaPoWriMo-like structure a few times a year. I tend to create little mini challenges for myself in months when I know I’ll have time. What I’ve found about writing a poem a day is that it’s very helpful in letting yourself focus on just one poem. What happens for me is that I begin to write a poem and soon I find myself obsessing over it in a way I wouldn’t otherwise. This is my Poem For The Day. I can spend all day on it if I want, or just fifteen minutes. It’s entirely possible to write a perfect poem in one day. I felt voiceless for so long, I wasn’t ever able to say what I felt out loud. I didn’t know how to say it. Posting online presented itself as a comfortable medium. I could say what I wanted to say in a way I still felt comfortable. Whenever, however I wanted to. The other great thing about NaPoWriMo is that there is less community pressure. You don’t *have* to post your work online, but if you do the community is much more chillax than the NaNoWriMo community, IMHO. (We’re poets, after all.) I find it works really well for Instagram and other social media platforms. I usually post excerpts from poems I’m working on instead of longer full-length pieces because I still want to be able to publish my poems eventually. And there’s something lovely about posting poetry online. You’re having a conversation with the reader directly. There’s no waiting about. You can find out right away what poems people connect with. Some people are opposed to poets putting their work online, but the reality is that you control what’s out there and some of today’s bestselling poets made their name online. Remember your words are your power. Never forget your words. Poetry is important to me because it helps me process the world. Writing a poem a day helps me focus and center myself, but I can’t do it all the time. So I’m grateful for the opportunity to convene with community in April! So how do you get started with NaPoWriMo? It’s pretty easy. Just sit down and write a poem a day in April! If you want, you can share your work on a blog, Instagram, Twitter, Facebook, or wherever you find love and community online. But none of these are necessary. In the end, it can be just you and a notebook or your computer if you want. It’s okay to stop if you need to. If you love National Poetry Month, check out my poetry feature on NPR’s Voices and Verses on April 1st, in which I read my poem “Blue Cadillac,” from my chapbook, Glimmerglass Girl. I’ll post a link here when it’s live!